When converting image to PDF especially converting scan image to PDF, we also meet some files which have been scanned slant. After conversion, the output PDF file is also slant. In order to solve this problem, maybe you can have a free trial of VeryPDF cloud based application VeryPDF Image to PDF Converter Cloud API, by which you can convert image to PDF and deskew image file. After conversion, the output PDF will be in perfect format. For now this cloud based application supports image like JPG, PNG, TIFF, BMP, GIF, TGA, PCX and many more. 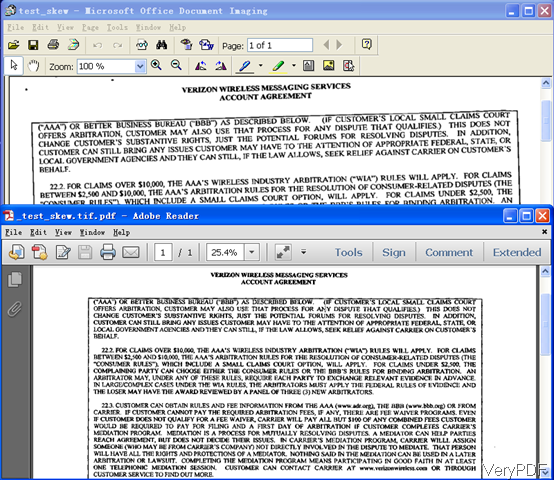 Meanwhile it also can help you convert image to searchable PDF file by OCR advanced technology. On VeryPDF there are also many kind of desktop version software which also can help you convert image to PDF and deskew image. But most of desktop version software has system limitation, say you can only use the Window version under Window system. When you need to run the conversion under multiplatform, API application is your best choice. It allows you to run the conversion without computer system limitation. When converting image to PDF by cloud based application, please refer to the following URL. You do not need to prepare anything like installation or downloading as the conversion is quite simply. By the above URL, we can convert file jpg image to PDF. When you converting your image file to PDF, please change the URL of image in the above long URL to real URL of the image you need to convert. Please upload local image to online image or else the conversion can not be done. At the end of the URL, please specify the output format as PDF. By the API conversion, you do not need to specify output folder as when conversion finishes there will be an URL of output file produced in a new tab. You need to copy it to a new browser and then press enter to download it to your computer. Please input the API code or else there will be watermark. All the API code of VeryPDF could be applied to this conversion. For now the API conversion can not support batch conversion. And in the future, we will try to add this function. By the above URL, we can convert image to PDF and deskew image. Parameter -deskew is important. By this cloud based API, we can convert image to PDF and deskew image. During the using, if you have any question, please contact us as soon as possible. This entry was posted in VeryPDF Cloud API and tagged deskew image, image to PDF. Bookmark the permalink.